Gainax's Neon Genesis Evangelion was a 26-episode psychological, religious, and philosophical roller coaster ride. Evangelion became a benchmark of anime production featuring many elements used in today's anime series like angst-ridden protagonists, child pilots with the fate of the world in their hands, and generous helpings of fanservice. After over 10 years, Gainax has released an updated revision of its crown jewel to reintroduce the series to a new audience and arguably to milk a few extra bucks from its cash cow. The Rebuild of Evangelion is a new set of four movies that retells and/or reinterprets the original series. The first Rebuild movie, titled You Are (Not) Alone, condenses the first six episodes of Evangelion to introduce the audience to the series. In the year 2015, an event called Second Impact has wiped out half of the world's population. 14-year old Shinji Ikari accepts an invitation to reunite with his estranged father Gendo at the UN Special Agency NERV. But in order to prevent Third Impact, the Ikari family reunion is cut short when Gendo forces Shinji to pilot a giant Evangelion robot to fight angels who are possibly sent by God, but definitely designed by God-only-knows. 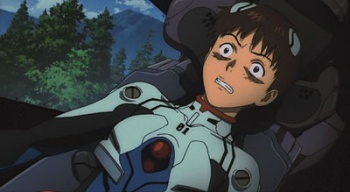 Between battles, Shinji and fellow NERV members attempt to deal with their own psychological baggage. With new animation and some updating, You Are (Not) Alone allows viewers of Evangelion to watch the series in a shiny new package. However, discerning viewers familiar with Evangelion will strip off the shiny new packaging to discover a dumbed-down version of the original series. You Are (Not) Alone aims for mass appeal with an emphasis on battles and a simplified story while truncating the subtle exposition and character development. It is a pity, given that watching elements of the story slowly piece together throughout the series was one of the best features of the original Evangelion. Now almost every subtle development is conveniently thrown onto the viewer's lap with little pacing. Characters who gradually became Freudian psychological cases now pretty much start off already messed up. Former conversations discussing humanity are reduced to disjointed blurbs or soliloquies. These elements feel like bones thrown for the fans who remembered the context from the original TV series. In terms of plot, You Are (Not) Alone lacks the innovation promised in the Rebuild series. It pretty much sticks to the first six episodes and only throws in one premature plot revelation and one cameo appearance. You Are (Not) Alone begs to ask why viewers interested in Evangelion simply just watch the original series instead of watching Rebuild of Evangelion. While You Are (Not) Alone does turn a thought-provoking series into a series of three battles, its new presentation does a good job of distracting veteran viewers from the fact it still is the same Evangelion while ensnaring new viewers into the series. The animation is significantly improved over its original incarnation with better battle scenes, improved character designs, and enhanced mechanical details. This new animation fits right at home with current anime standards so new viewers can watch it without feeling dated, while veterans of Evangelion can enjoy the new look of the classic characters. The new English dub is definitely improved, and better matches the tone of the series. For the most part the Japanese cast and original score remain unchanged. Probably the biggest thing to note in this upgrade is the blatant presence of brand name products like Doritos and Pizza Hut. Nothing spells successful franchise better than product placement. Despite not quite being the new vision of Evangelion promised, You Are (Not) Alone does its job of getting people to remember the show while introducing potential new fans to the story. The now-simplistic storytelling and flashy effects will attract new viewers by not being overly complicated, which is probably a social commentary on the attention span of viewers nowadays. Fans of the original Evangelion are still very likely to watch if only to be disappointed at the lack of innovation while marveling at the potential of Rebuild. Just as the credits end and cynics write off this new Evangelion movie series as an obvious cash-in akin to George Lucas and his constant Star Wars rehashing, the trailer for the second movie You Can (Not) Advance taunts viewers with new developments including new Evangelion robots, a new character, and a potentially new interpretation of the series. It is just a pity Gainax was unable to implement these new developments during You Are (Not) Alone. Bottom Line: You Are (Not) Alone streamlines the first six episodes of the groundbreaking anime series Neon Genesis Evangelion into a 98-minute movie that can appeal to general audiences while potentially alienating its original fan base.Veteran viewers can admire the new animation while reminiscing about how much better the original series was. Those unfamiliar with Evangelion will find You Are (Not) Alone easier to comprehend than the original series. Recommendation: Like it or hate it, You Are (Not) Alone is definitely worth a look. Amid all of the newfangled enhancements inYou Are (Not) Alone, Tom Tonthat is glad that Shinji's personality remained the same. Who could stand more whining?